Some mysteries and crimes are of the magical sort, and that is when specialized mage detectives are hired. Nellie is one such mage, being exceptionally inquisitive by nature. She makes a living of solving everything from monster infestations and ancient curses, to finding that annoying fairy that keeps messing with people’s shoelaces. 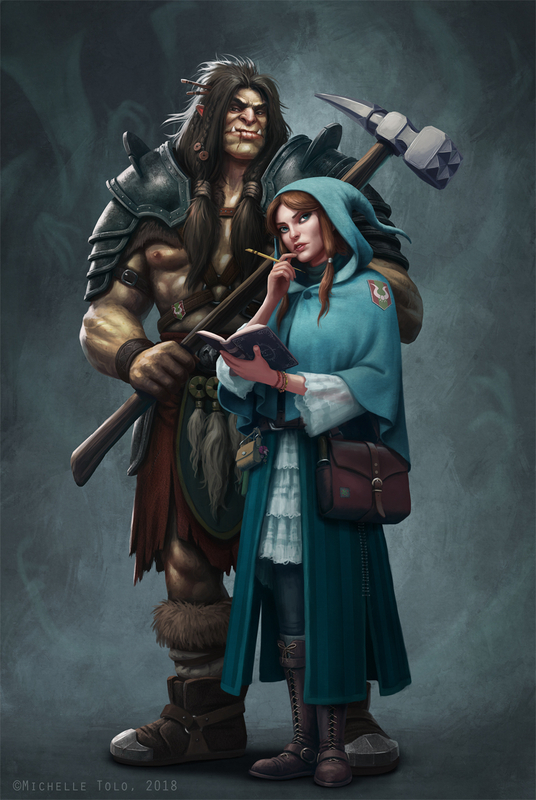 As a helping hand and guard, she hired Brahn; a simple, efficient and somewhat moody orc. Their friendship may not be of the most amicable kind, but they work well enough together and watch each other’s back. This is a personal project I’ve had fun with lately, striving to tell stories through design. I did a few rough sketches showing the characters in typical everyday scenarios as well, which was very helpful to learn more about them.